Diversity • The growing number of foreign-language LDS congregations speaks to an ever-changing Utah. 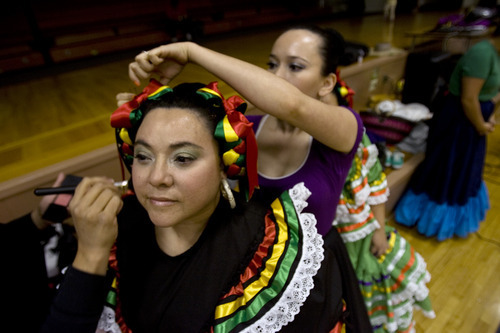 Kim Raff | The Salt Lake Tribune Sarahi Ponce has her makeup done before a rehearsal at a Salt Lake City LDS ward for a Latino cultural program to be held next week in Spanish at the Conference Center. Kim Raff | The Salt Lake Tribune Dancers practice a routine at a Salt Lake City LDS ward for a Latino cultural program to be held next week in Spanish at the Conference Center. Rick Egan | The Salt Lake Tribune April Paw holds Hsa Paw Wah, as she heads home from church, along with her husband My Robert Shwe, Mu Robert Shwe, Robert Licon Shwe Ehchuna Moogay, and Mu Law Eh, in the foyer of church, they attend the Columbus branch of the Church of Jesus Christ of Latter Day Saints, for Burmese refugees, Sunday, December 20, 2009 Tribune file photo Nicole Rivas, 10, left, and Nadia Rivas, 3, sing songs during the Spanish-speaking LDS service for children at Stake Center at 3900 S. 4000 West in 2006. 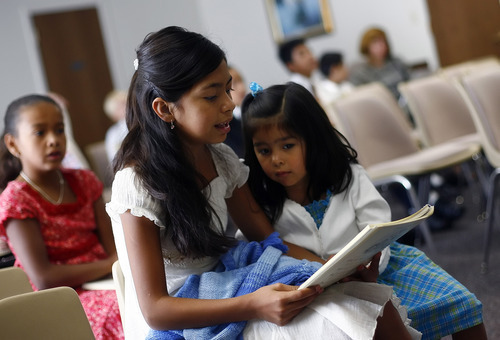 Tribune file photo Neftali Montoya, 11, left, and Henry Martinez, 11, participate in the Spanish-speaking LDS service for children at Stake Center at 3900 S. 4000 West in 2006. 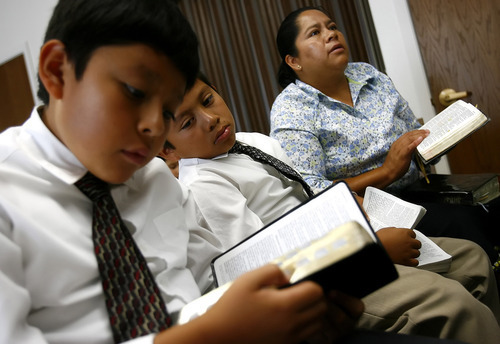 Tribune file photo L-R Jesus Saavedra, 9, Christopher Saavedra, 7, and Gloria Saavedra read along in the bible during a scripture reading during Spanish-speaking LDS service for children at Stake Center at 3900 S. 4000 West in 2006. Mike Terry | Special to the Tribune (From left) Jordan Tutasi, Mason Fu'e and Tala Losi have a laugh during a meeting of young men who belong to the Volta Samoan Ward at a meetinghouse of The Church of Jesus Christ of Latter-day Saints in West Valley City, Utah, on Thursday, Oct. 11, 2012. Mike Terry | Special to the Tribune Cub Scouts from Pack 4183 of the Volta Samoan Ward sing cheers before being awarded pizza at a meetinghouse of The Church of Jesus Christ of Latter-day Saints in West Valley City, Utah, on Thursday, Oct. 11, 2012. The Scouts were learning how to make quick meals from simple grocery items. 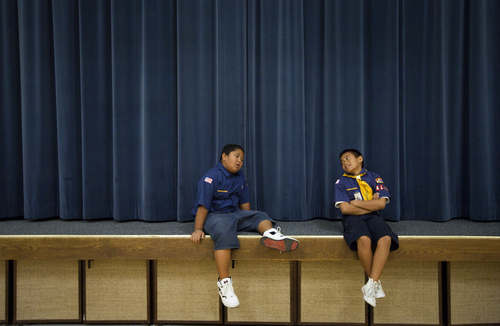 Mike Terry | Special to the Tribune Cub Scouts Dylan Leatutufu and Desmond Tautaiolefue from Pack 4183 of the Volta Samoan Ward sit on the stage after running laps in the gym at a meetinghouse of The Church of Jesus Christ of Latter-day Saints in West Valley City, Utah on Thursday, Oct. 11, 2012. The Scouts were learning how to make quick meals from simple grocery items. Mike Terry | Special to The Tribune T.J. Tutasi offers a prayer last week during a meeting of young men who belong to the Volta Samoan Ward at a meetinghouse of The Church of Jesus Christ of Latter-day Saints in West Valley City. Mormon scriptures long predicted that "every man shall hear the fullness of the gospel in his own tongue." Of course, the Utah-based Church of Jesus Christ of Latter-day Saints sends missionaries worldwide to preach in native languages, and it translates General Conference speeches into scores of tongues. But weekly in Utah, 199 LDS congregations also hold services in languages other than English  mostly for recent immigrants. That is nearly three times more than the 74 foreign-language LDS wards and branches that existed in the state a decade ago, reflecting how Utah is growing more diverse and how the Mormon church tries to help immigrants feel comfortable as they worship. "Most Latter-day Saint church services in the United States and in Utah are conducted in English," LDS Church spokesman Scott Trotter said. "However, some non-English speakers participate more fully and better understand church teachings when they worship and socialize in congregations taught in their native language." 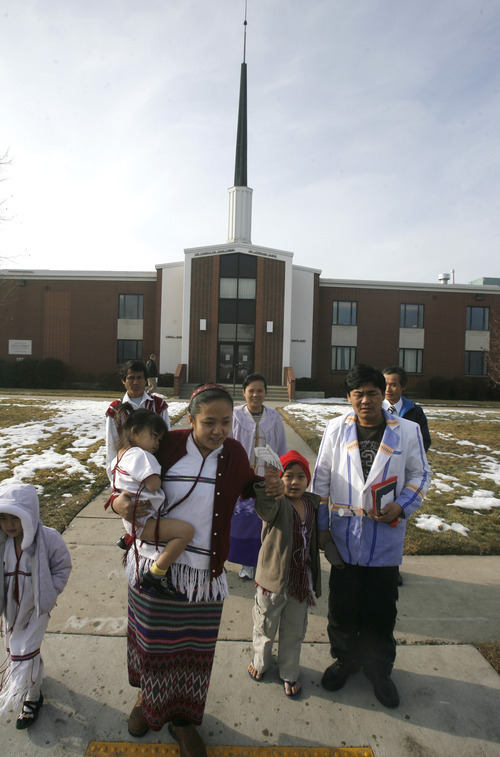 The church offers congregations in Utah that speak 14 languages besides English. Two of those were not offered here 10 years ago: Swahili (an African language) and Karen (a language of Burma or Myanmar). Each had one branch, or small congregation, organized in 2009 in Salt Lake City. 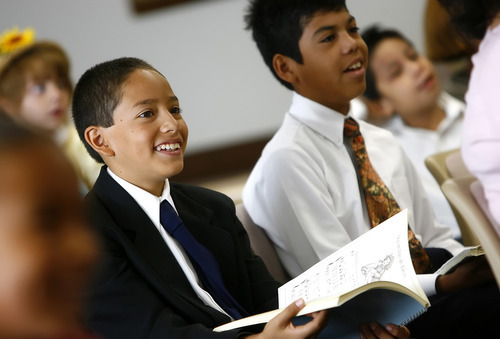 Other foreign-language congregations in Utah include: Tongan (29 wards and branches); Samoan (14); American Sign Language (seven); Portuguese (three); Mandarin, Korean and Japanese (two congregations each); and Cambodian, German, Laotian and Russian (one congregation each). Spanish has by far the most non-English congregations in Utah: 134, up from 37 a decade ago. Two-thirds of all foreign-language units in Utah speak Spanish. That's hardly surprising. 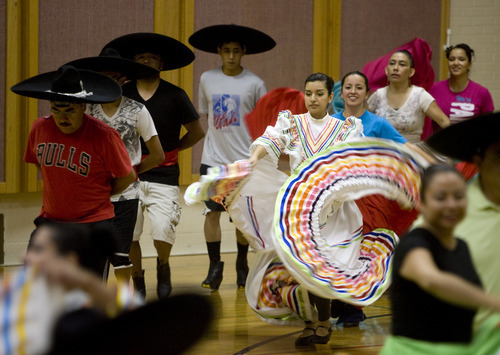 The 2010 Census showed 13 percent of Utahns are Latinos, making them the state's largest minority group. Utah's Hispanic population surged by 78 percent between 2000 and 2010  swelling by nearly 157,000 people to 358,000 total. "When I moved here 15 years ago, it seemed like there were only five or six Spanish branches in the Salt Lake Valley," recalls Vicente Gonzalez, president of the Spanish-speaking Canela Tree LDS Branch in West Valley City. Now Utah's second-most-populous city has 15, the most of any in the state. Gonzalez said his congregation of about 120 people has Mormons from Mexico, El Salvador, Uruguay, Paraguay, Chile, Nicaragua, Peru and Argentina. His branch is more than a congregation, "it is a family," he said. "All are immigrants. We all left family behind in our countries, but we have a family in the branch that strengthens us spiritually and emotionally." Gonzalez said worshipping in their native language "is a blessing because we can learn more about God in a way that is easier to understand and is more rich for us. It's a blessing to go to church and not worry about understanding what is said." His branch does offer English classes  it's "the language of the prophets," he said  but many in the older generations find it difficult. "Our inspiration is President [Dieter F.] Uchtdorf, a counselor in the [church's governing] First Presidency. He is German, but he learned to speak the language of the prophets even though it was hard for him." The same Granger South Stake, or cluster of LDS congregations, that includes Gonzalez's branch also boasts the Samoan-speaking Volta Ward. It is big. Bishop Mataitai Fauatea says his ward has 350 members and fills not only its chapel every week but often overflows deep into the adjacent cultural hall as well. Census figures shows that one of every 16 Samoans in America lives in Utah  as does one of every four Tongan Americans. Among U.S. cities with populations greater than 100,000, West Valley City ranks No. 2 only to Honolulu for its number of Pacific Islanders. Fauatea says his ward helps his members "feel like we are home. It makes us feel united. It helps us preserve our culture and our language" and "makes it easier for the older people to understand church meetings." He said most youths speak English, and his ward's Primary  the organization for children  holds all its classes in English. He said at least one talk each week in its main worship service is also in English to help the youths. "But we also have at least one in Samoan for the older people," who have more difficulty in learning a new language. While Utah Mormons are known for arriving late and sitting in the back at meetings, Samoan Latter-day Saints are the opposite. They often show up hours early and prefer seats in the front. Fauatea says that comes from a tradition in Samoa, where chiefs have people cook early on Sundays and then spend the day in church. "We still like to do that here." When congregations meeting before the Samoan ward end their services in the shared chapel, they often find Samoan members rushing in an hour before their own service begins. "We like to get seats up front in the chapel," Fauatea said. "There is less noise there. We don't like to sit in back." Trotter said Utah's language diversity was also showcased during a multi-stake LDS conference held in early September in Salt Lake City. "The conference," he said, "was translated into American Sign Language, Cambodian, Cantonese, French, German, Japanese, Laotian, Mandarin, Portuguese, Russian, Samoan, Spanish, Swahili, Thai and Tongan." "For it shall come to pass in that day, that every man shall hear the fulness of the gospel in his own tongue, and in his own language." The LDS Church will present a Latino cultural program Friday, Oct. 26, and Saturday, Oct. 27, at 7:30 p.m. in the Conference Center in downtown Salt Lake City. The celebration will feature a 364-voice adult choir, a 120-voice children's choir and performances of Latin American, Native American and Pacific Islander folk dances  all commemorating the Book of Mormon's story of Christ coming to America. The performance will be in Spanish, with a limited number of headphones available for those who would like to listen in Portuguese or English. For free tickets, go to lds.org/events.